Package includes nightly Free Dinner on Moorea and Bora Bora! Enjoy 1 night on arrival at the Tahiti Ia Ora Beach Resort by Sofitel, 4 nights at the Sofitel Moorea Ia Ora Beach Resort; situated in a lush tropical garden setting bordered by a magnificent white sand beach and 3 nights at the Sofitel Bora Bora Private Island; located on a private island surrounded by a turquoise lagoon and it’s own coral reef. Because of its stunning scenery and heart-shaped formation, it's no wonder so many people fall in love with Moorea! Bora Bora, where perfect white-sand beaches give way to emerald waters and colored fish animate the coral gardens as they greet the giant manta rays. Includes Full Breakfast daily, a Tahitian Black Pearl for the Bride, and special Hotel Honeymoon Bonuses such as Champagne or Tropical Flowers. International and Inter-Island Airfare round trip and Airport Transfers included. •	Complimentary hotel Honeymoon Bonuses e.g. Champagne, Flowers etc. Superior. The Sofitel Bora Bora Private Island is located on a private island and is only two minutes by boat from the main island. It offers a secluded, picture-perfect setting surrounded by a turquoise lagoon and its own coral reef making it a perfect location for snorkeling. First Class. Situated on the east coast of Moorea in a lush tropical garden setting bordered by a magnificent white sand beach, this is the only hotel on Moorea with a view of Tahiti. First Class. 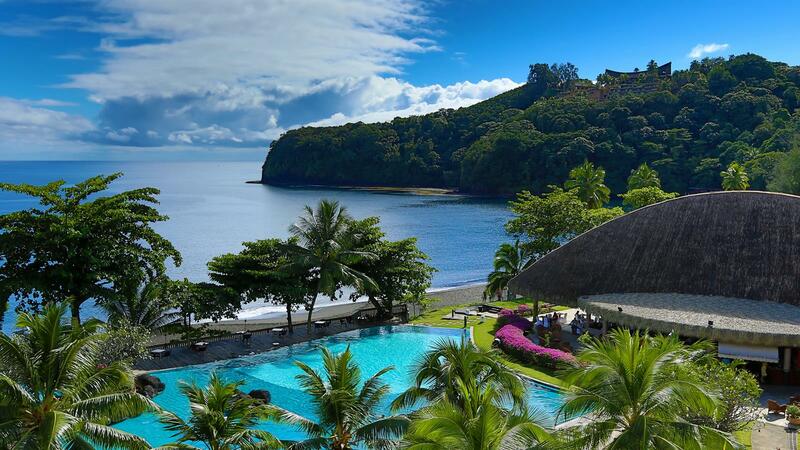 Located on one of the nicest white sand beaches on Tahiti’s west coast, the Tahiti Ia Ora Beach Resort faces the lagoon bordered by the coral reef with the island of Moorea in the background.